Fresh and fragrant rose water is made from pure rose petals. Rose water is used in abishegams and pujas. During abishegam, the rose water is sprinkled on the statues of deities to denote the bathing of gods and goddesses. It is believed that when the idols are bathed in rose water, the devotees’ thoughts are also cleansed. Rose water is also sprinkled on people during weddings and homams. 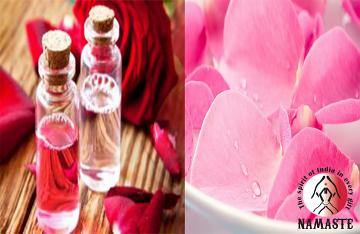 We neatly fill the rose water in a tightly sealed bottle and sell at a very nominal price. This item in Hindu Puja Items category was first added to our catalog on 08-05-2017. Buy Fresh and Fragrant Rose Water (Gulab Jal) Bottle, sold & shipped by Namaste where you can shop online for Indian Gift Store: Handicraft, Home Decor, Wedding, Rakhi & Diwali Gifts. This Puja Samagri collection has been tagged as Rose Water, Gulab Jal , fresh fragrant rose water, ayurvedic.